Thank you so much to Louise for the great question! I’m have a few suggestions but first off, this is a great opportunity to talk about a piece of NYC art I’ve been obsessed with for a while – it’s the Monumental Guide to New York, a really cool, eye-catching print available from Swedish website “My Guide To,” and designed by David Ehrenstråhle. Here it is in Joanna Goddard’s apartment (photo by Alpha Smoot). 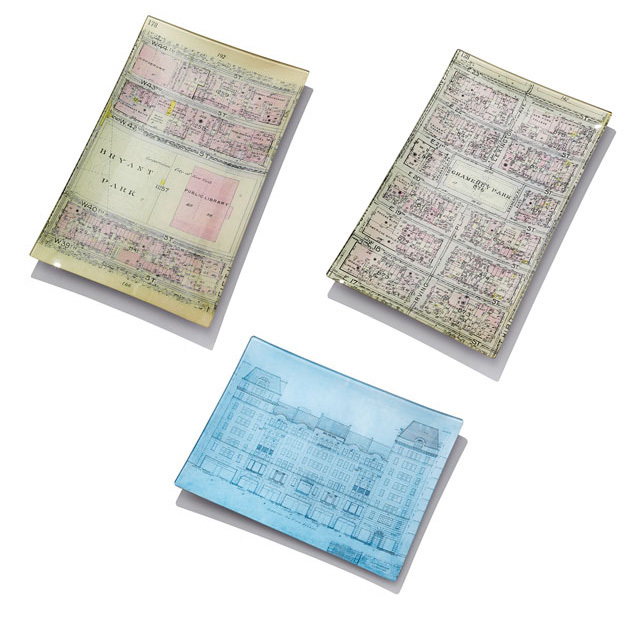 Rifle Paper Co.: Manhattan Art Print ($40-$60) // NYC Art Print ($40) – I have both of these – I think the NYC print in particular captures the energy of the city! 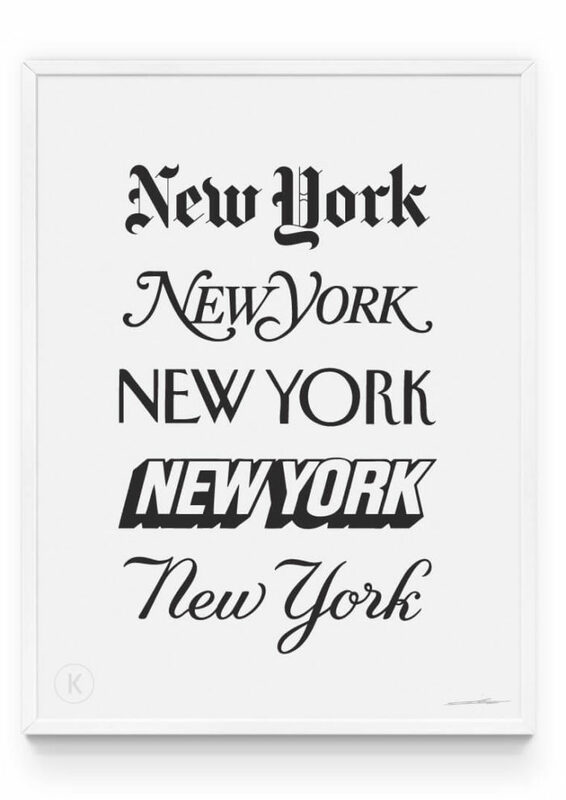 Note To Self Print Shop: New York City Girl ($18-$60) // NYC ($18-$60) – these are simple and chic. Danielle Kroll via Buddy Editions: City Living ($50-$100) // Manhattan Matches ($50-$100) – I have the City Living print and gave my sister the Matches print for her b-day. I LOVE the Matches print, wish I had room for it myself! Jessica Durrant via Etsy: Skyline ($25) // Brooklyn Bridge ($25) // Chrysler Building ($26) – I love Jessica’s watercolor prints – I think they’re unique and unexpected. The Everygirl: Empire State Letterpress Print ($40) – a simple, modern, graphic look. 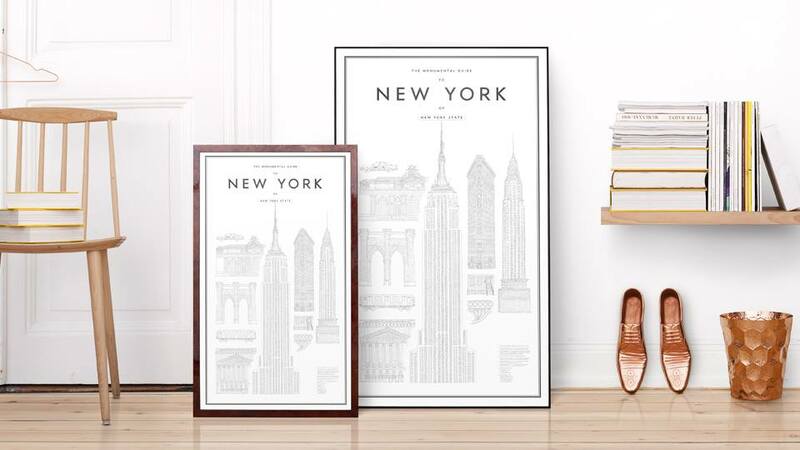 Minted.com: New York City Foil-Stamped Map ($34-$52) // Brooklyn Bridge Foil-Stamped Wall Art ($31-$49 – also with option to buy framed, still under $100) – a pretty metallic touch. 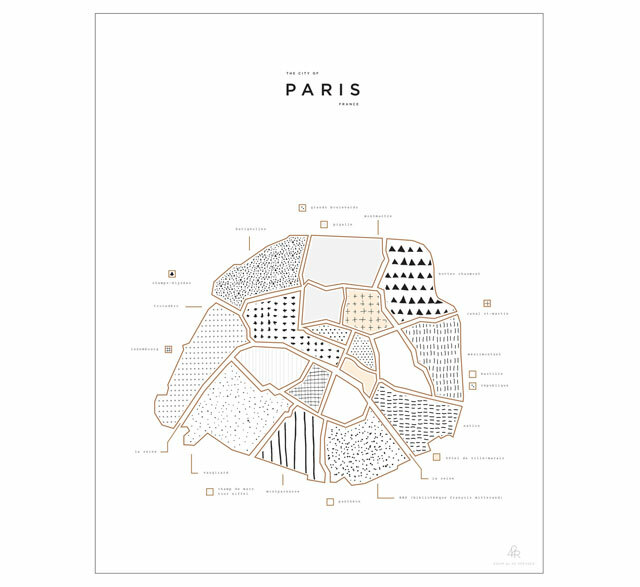 Paris vs. New York by Vahram Muratyan: L’Obsession ($35-$95) // La Facade ($35-$95) – quirky, colorful, and charming! 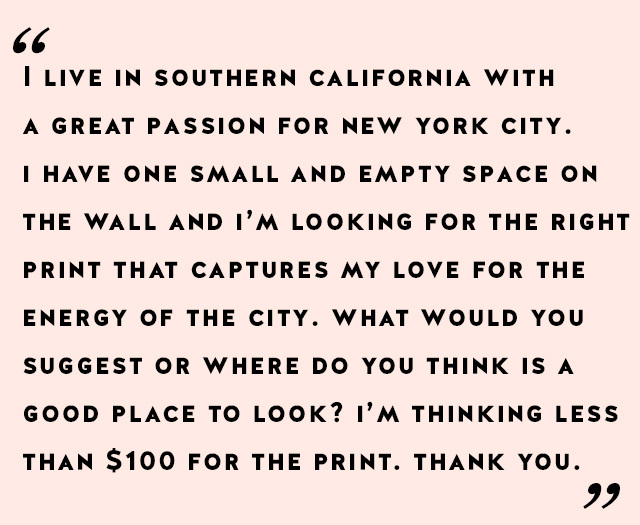 Kathryn Warren via Buddy Editions: New Y0rk City ($50-$100) – quirky and fun. Now for something that’s a little over $100, but really special, there are these John Derian trays that my Mom and I came across the other week when we were in Bergdorf Goodman. They’re SO much nicer in person than on the computer screen! On the website they have a few options but in the actual store, they had piles of them, all with different neighborhood maps represented. 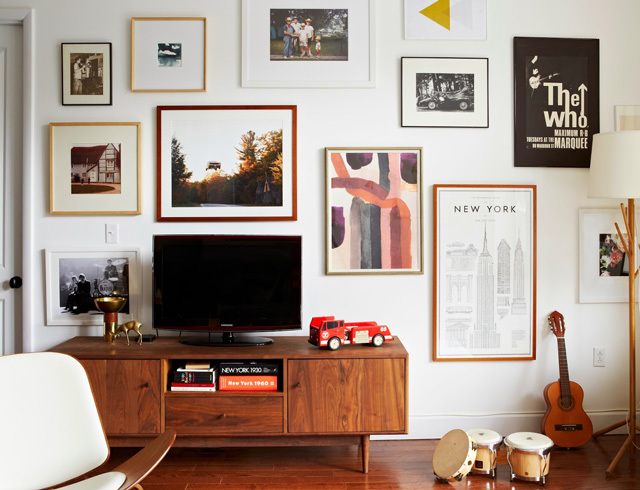 I think one of these would look amazing mixed in with art in a gallery wall, and of course, a bunch of John Derian trays and plates all together looks incredible as well, which you can see in this post. For vintage New York City maps of all shapes, sizes, and price points, check here. Lots of energy in this photographer’s work. I hope that helps for any of you out there looking for affordable NYC art. If you have a question you’d like me to answer about blogging, Photoshop, Lightroom, photography, decorating, organizing, or anything at all, just leave me a comment on this post, e-mail me at jclair24@gmail.com, or reach out to me on Twitter! I am also on a similar hunt for affordable art that represents my new home aka the Big Apple! Such great picks Jackie! So happy this is helpful! I love all of these finds. 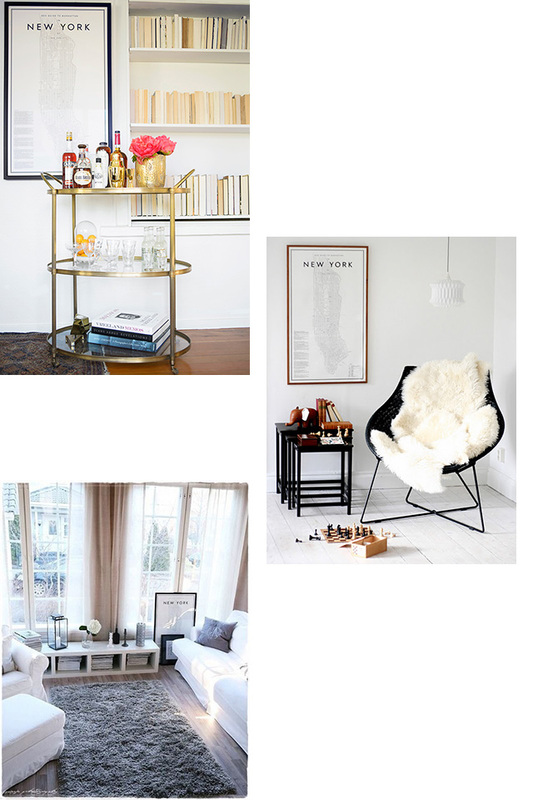 I definitely want to add a few to my apartment.